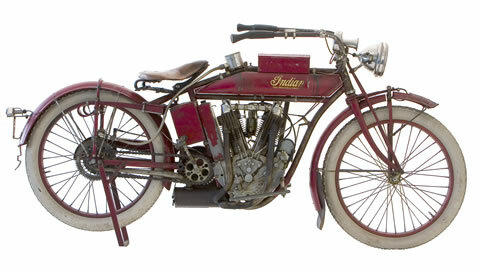 The "Indian Motocycle Co." was founded as the Hendee Manufacturing Company by George M. Hendee and Carl Oscar Hedström. 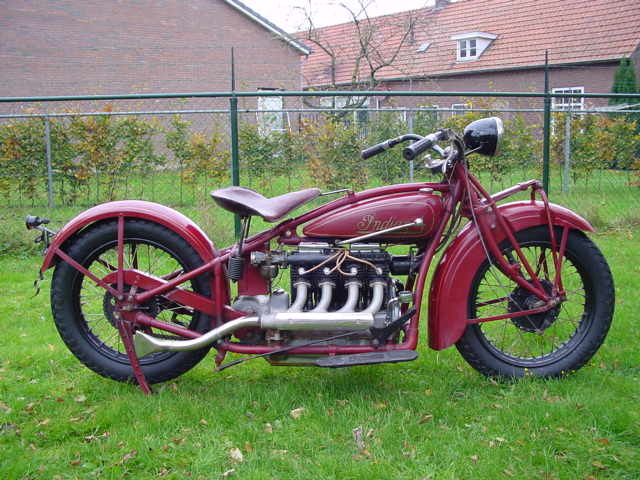 Both Hendee and Hedström were former bicycle racers who teamed up to produce a motorcycle with a 1.75 bhp, single cylinder engine in Hendee's home town of Springfield. 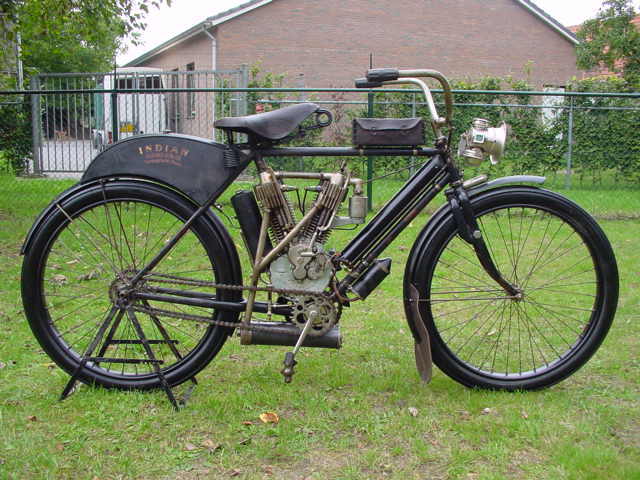 The bike was successful and sales increased dramatically during the next decade. 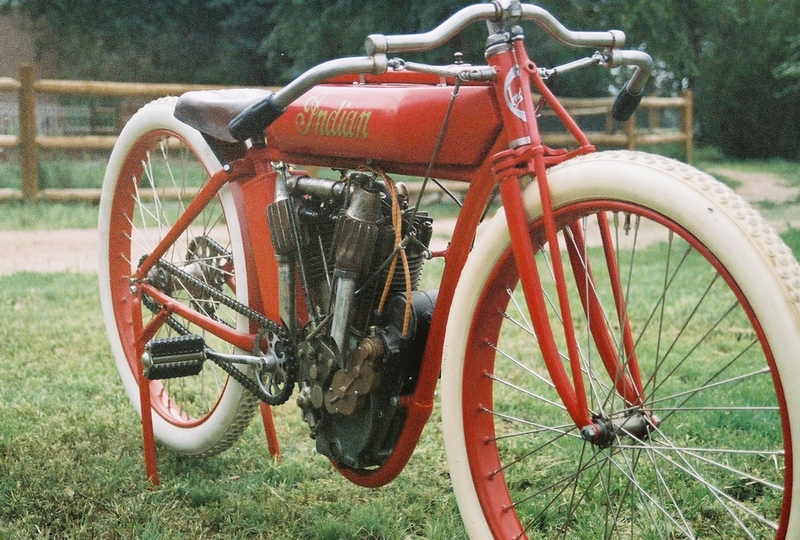 Indian motorcycle more info..
1905 Indian Camelback Single cylinder. 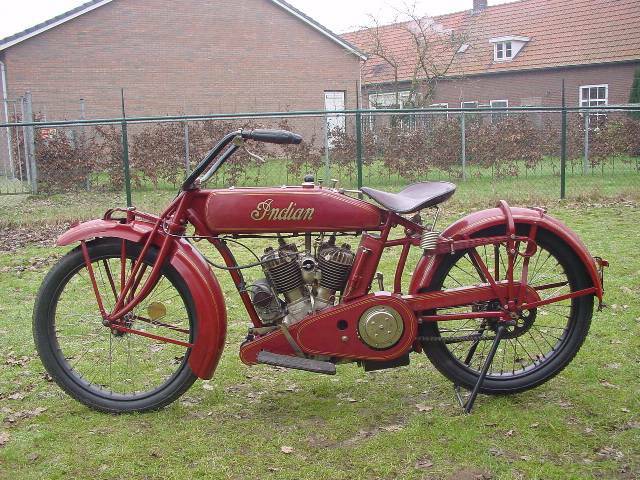 1913 Indian Twin, 1000cc Pre WWI Indians are rarely offered; they are highly coveted because of their beauty of design and exclusiveness. 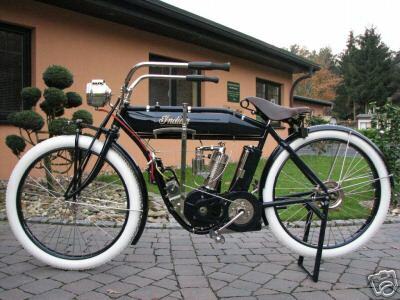 This 1913 Big Twin has the 1000cc inlet-over-exhaust engine and Hedstrom carburettor. 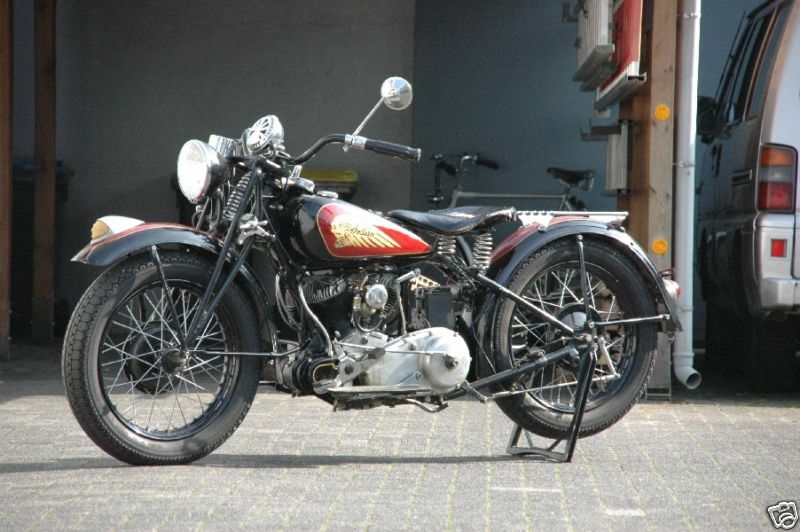 Transmission is via an overdimensioned clutch, which takes care for a flexible power transfer to the rear wheel. 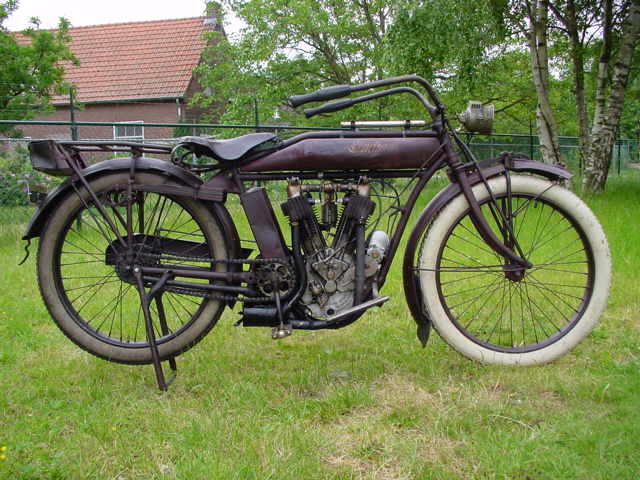 Clutch control is by a long lever beside the petrol tank; alternatevily a foot pedal can be used. 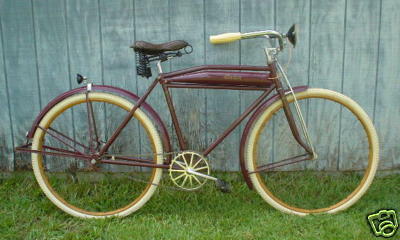 The single speed type was very popular as a solo machine. 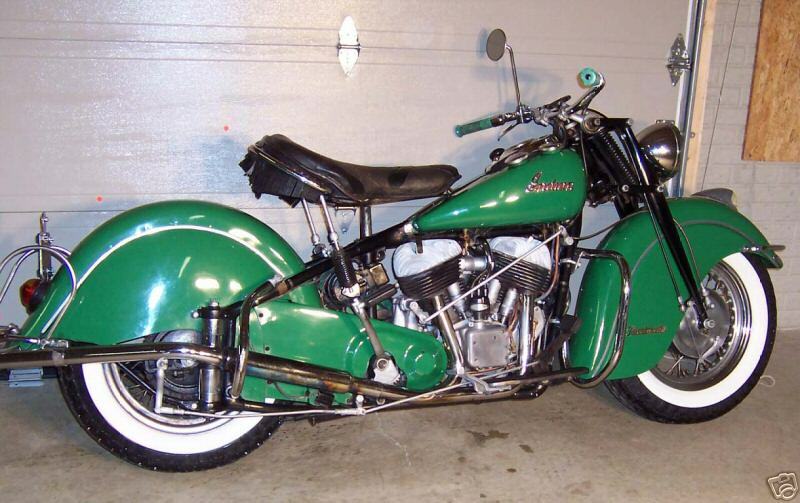 The big 28” wheels, front and rear leaf-spring suspension and slim tank design give this legendary Indian graceful lines. 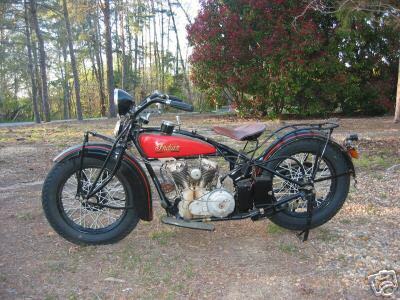 1926 Indian Scout Combination, 600cc The Scout features a semi-unit construction power plant with a 3 –speed transmission bolted on to it. Primary drive is by a set of helical gears that are enclosed in a cast aluminium cover and run in an oil bath. The clutch is foot-controlled. 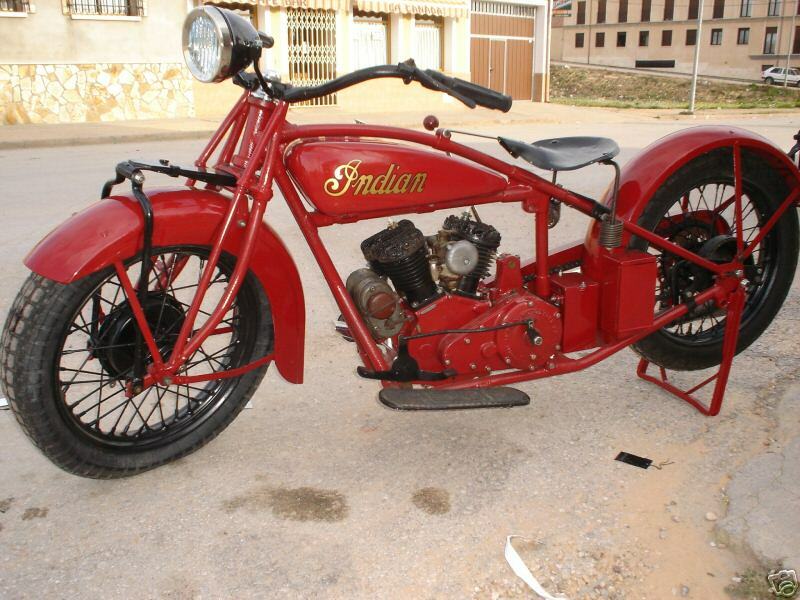 1926 Indian Prince 21 cubic inch, single cylinder. 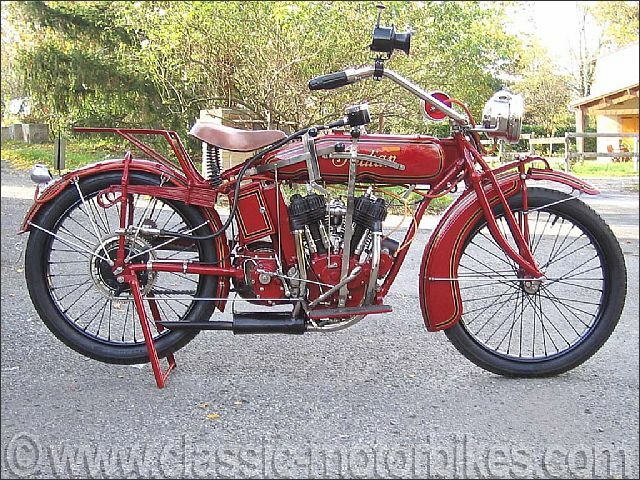 1928 Indian Scout 101, 750cc In 1928, Charles Franklin, the Indian engineer and former racer responsible for the original Scout, tweaked the design to create the 101 Scout. 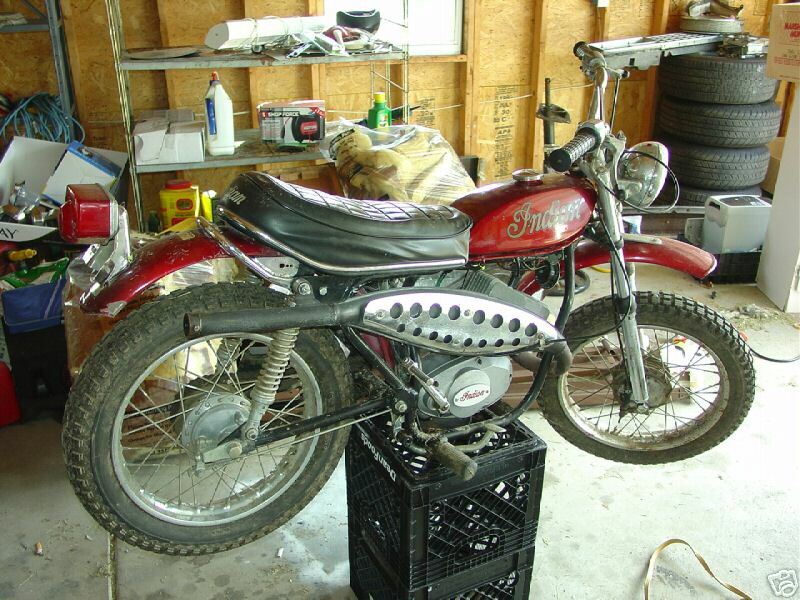 It incorporated a number of changes prompted by real-world racetrack experience with the original Scout, including a stronger frame, better suspension and steering, a 3-inch increase in wheelbase, increased fork rake, a low, 26¼-inch seat height, and a front brake. 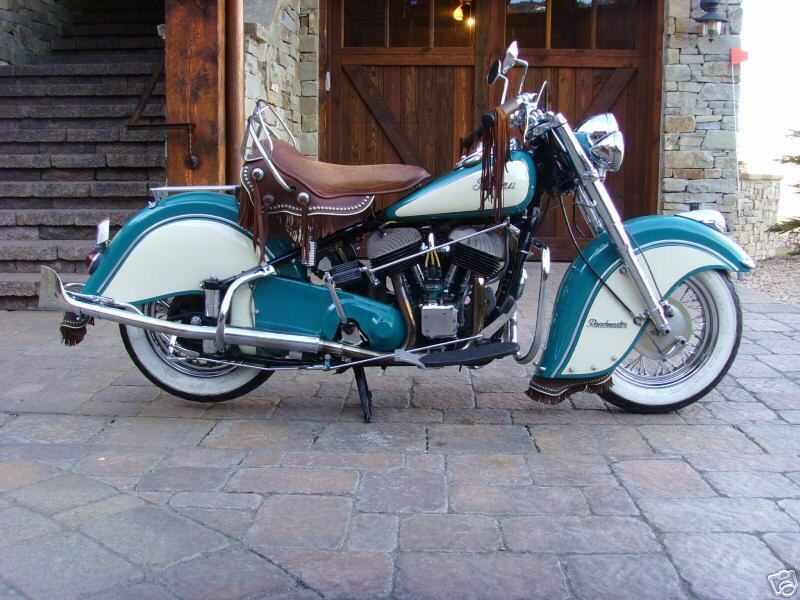 Unfortunately, though, the 101 Scout had a much shorter production run. 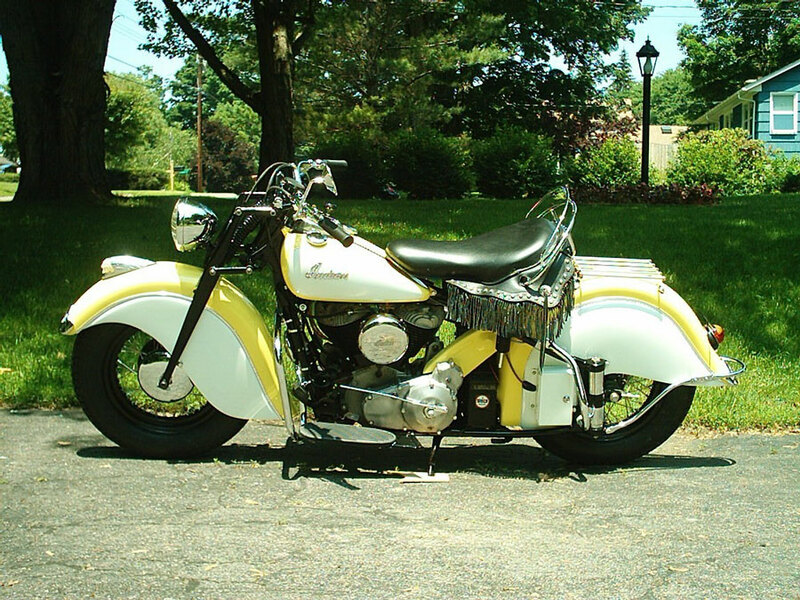 The model lasted a mere four years in the Indian line-up until the Depression forced the company to find ways to cut production costs. 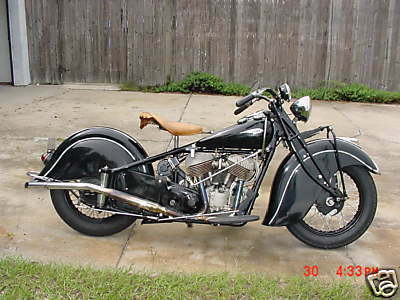 One way Indian did that was by putting the Scout engine into the larger Chief frame beginning in 1932. 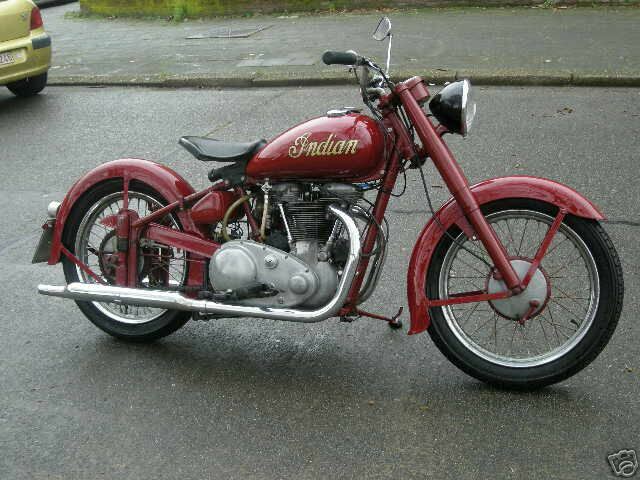 The result was a bike that was bigger, heavier, and, many would argue, not as capable as the 101 was; many Indian enthusiast consider the 101 as the best Indian ever built. 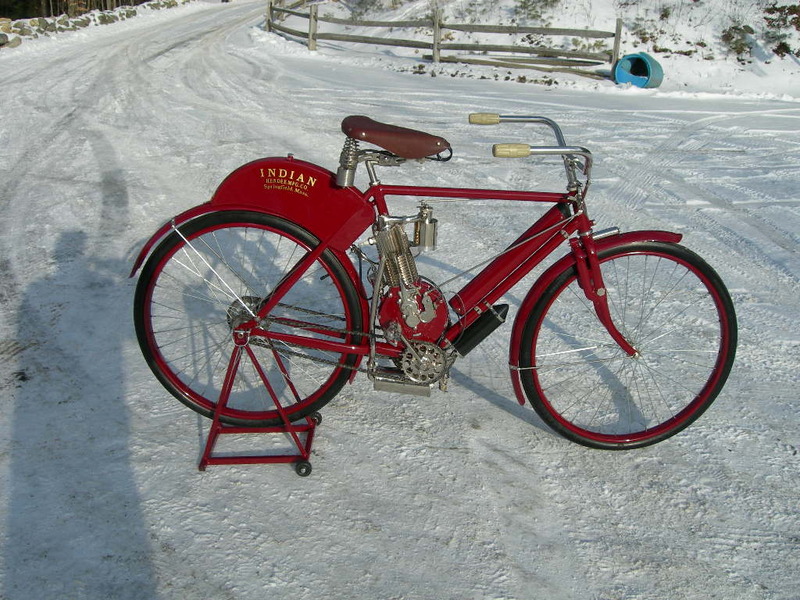 Stability is such that the machine can easily be steered into a side street by applying knee pressure only, hands in your lap. No wonder wall of death riders chose the 101 as their favourite mount! 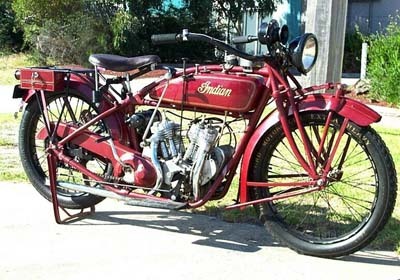 1928 Indian 401, 1265cc The 1265 cc engine has overhead inlet valves and side exhaust valves and delivered in the late twenties form about 30 HP. 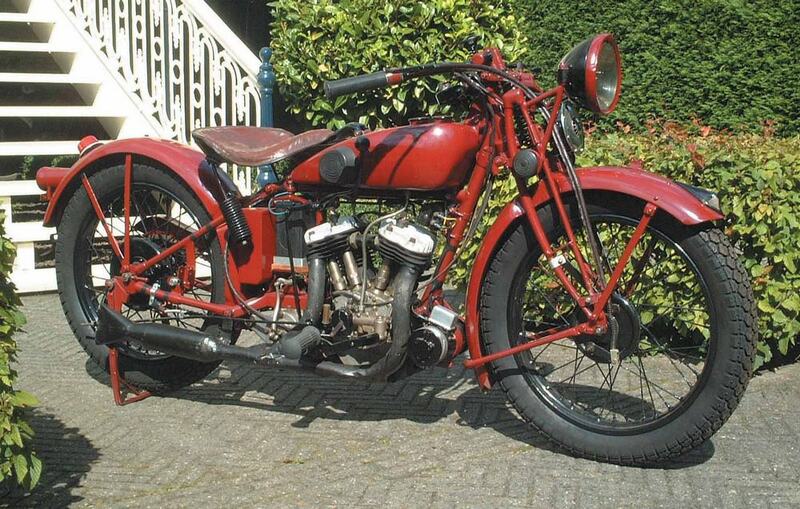 About ten years later this had grown to about 40 HP and tuned examples were known to put out some 50 HP! 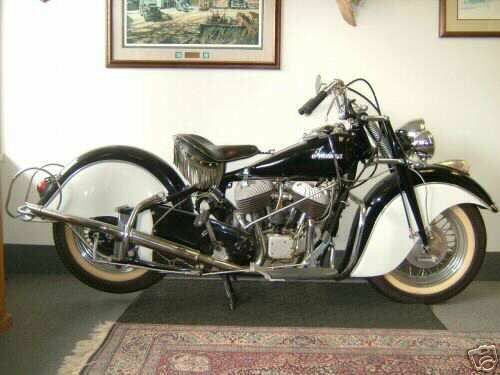 But with output also the weight grew: a 1928 4 would weigh about 455 lb, a 1942 model ( the last year of manufacture) weighs 568 lb. 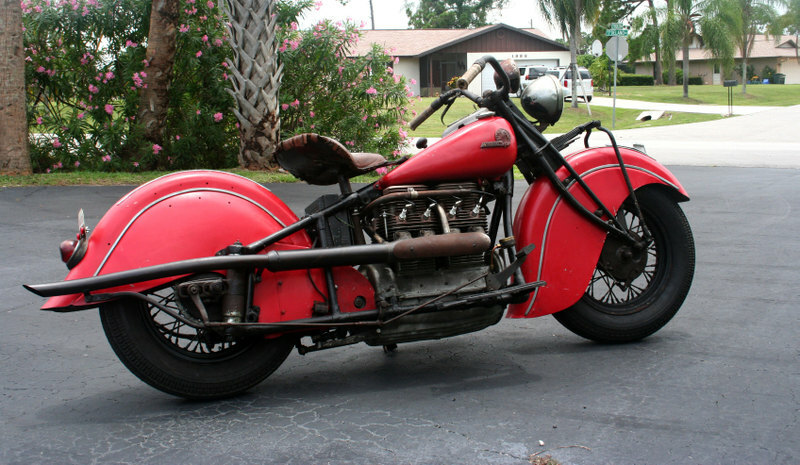 The Indian Four of 1928-31 shares most of its cycle parts with the graceful model 101 Scout: it’s a low-built, pleasantly streamlined machine, with the added attraction of a smooth and silent, car-engine like power source. 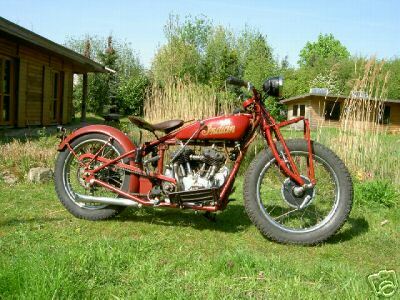 The 101 Scout was an evolution of the Scout that had been introduced in 1920 and enlarged to forty-five cubic inches in 1927. 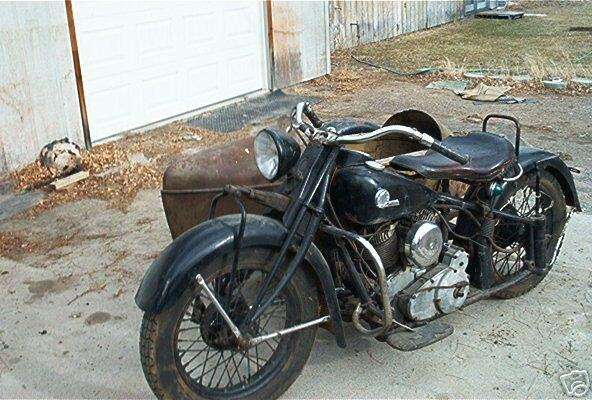 It had a stronger frame than the earlier Scout, and had more fork rake, a longer wheelbase, and a lower seat height. 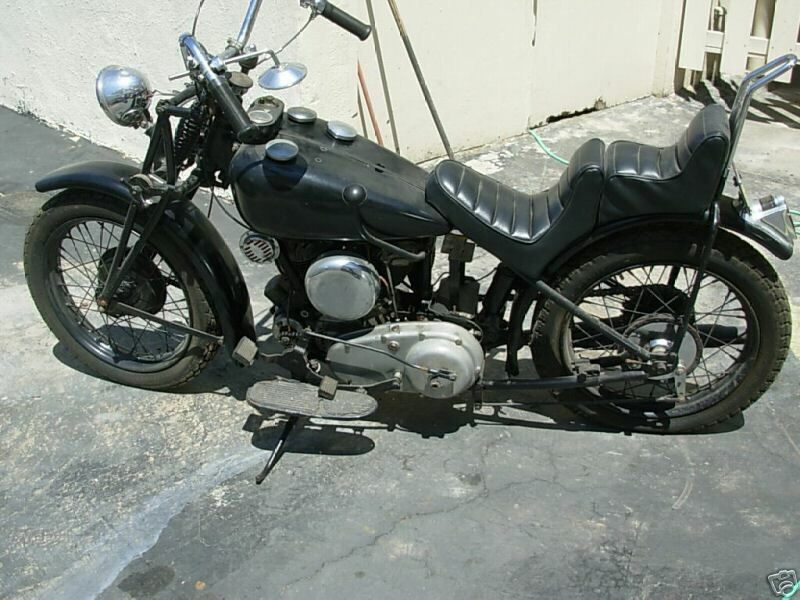 It was the first Scout model with a front brake. 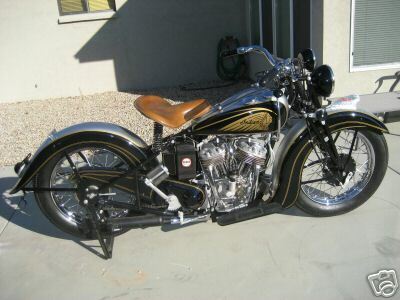 The 101 Scout was replaced in 1932 by a model that used the contemporary Chief frame. There was a widespread negative reaction to this.It is speculated that this was done to reduce costs by rationalizing production, which became necessary during the Great Depression. 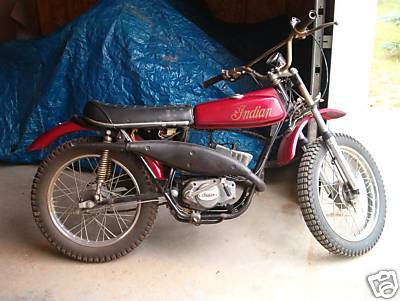 The 101 Scout was noted for its handling and was popular with racers, hillclimbers, and trick riders. 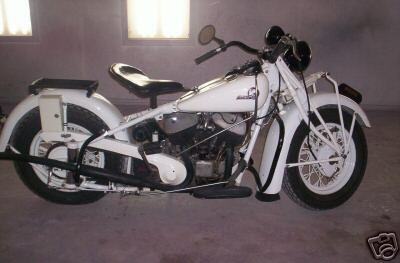 It is still used in wall of death stunt exhibitions. 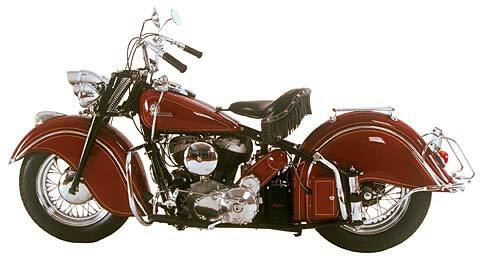 Indian Motocycle enthusiasts have differing views on the replacement of the 101 Scout. 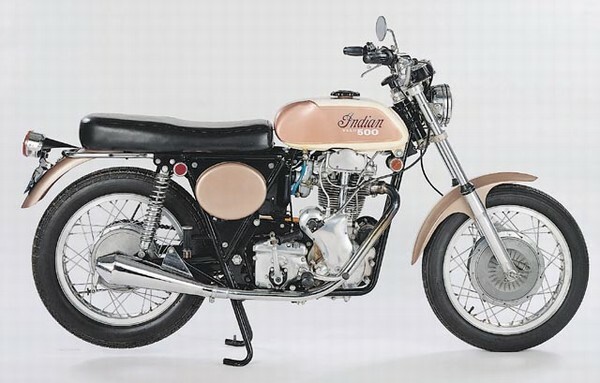 Fans of Indian's technical achievements acclaim the 101 Scout as the pinnacle of Indian technology, while fans of classic Indian styling hail its replacement for bringing classic Chief styling to the Scout line. 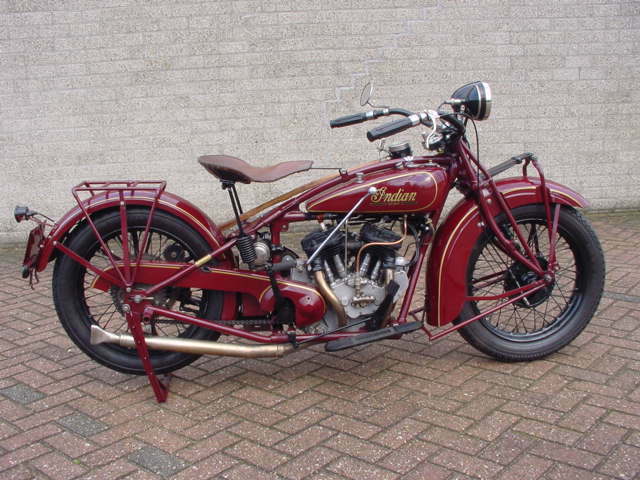 1932 Indian Scout Pony 500cc, 30.5 cubic inch - it utilised the basic Prince frame - the marque later became the 'Junior Scout' and the 'Thirty Fifty' (after the engine size), both were marketed as Ladies Motorcycles. 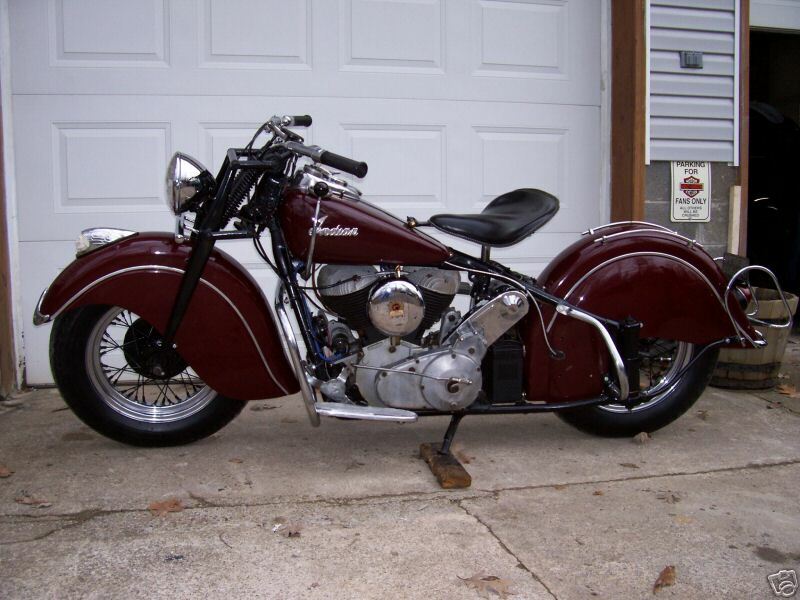 1936 Indian Sport Scout The Sports Scout was an entirely new high performance machine which would hopefully revive the flagging prospects of the Indian motorcycle company. 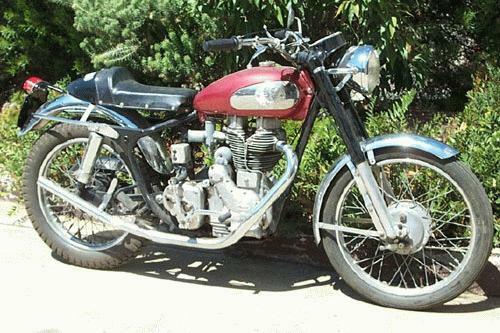 In some respects it ressembled the European machines with girder forks, the less valanced mudguards and a shorter wheel base than previous examples. 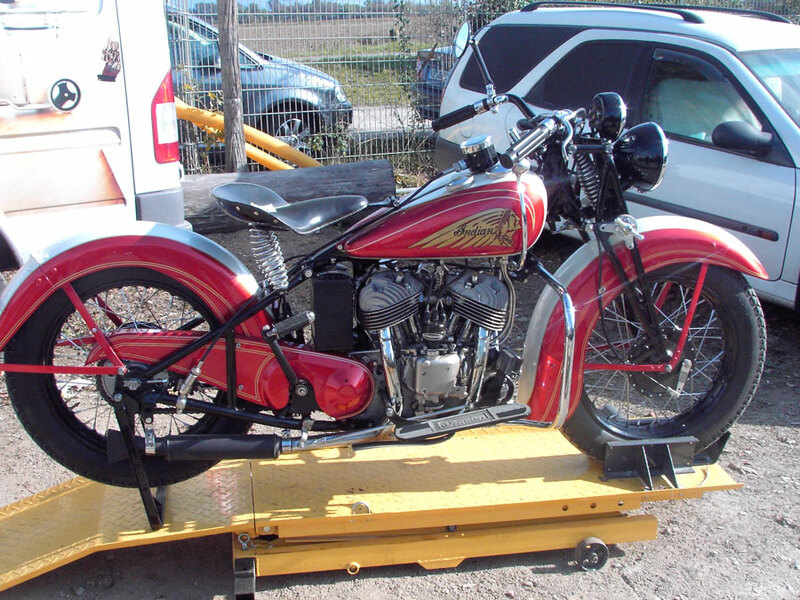 They produced an attractive motorcycle and figures of up to 128 mph were recorded through a quarter mile speed trap at the LA 45 Club Annual Speed Trials which is not bad for a side valve. 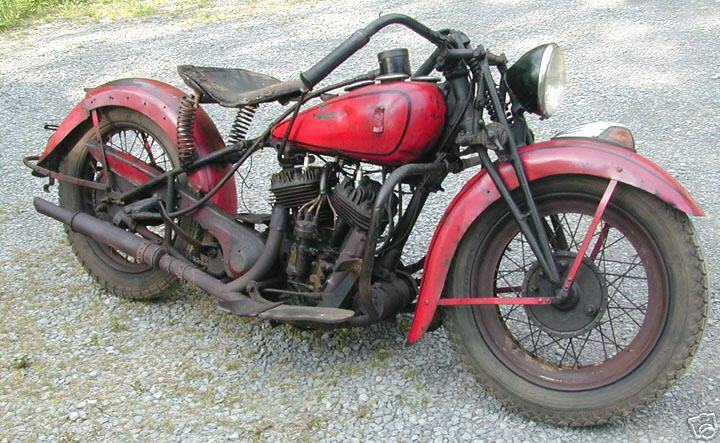 1940 Indian Chief Police Dispatch Trike Ultra-rare Indian, even rarer 3 speed with reverse. 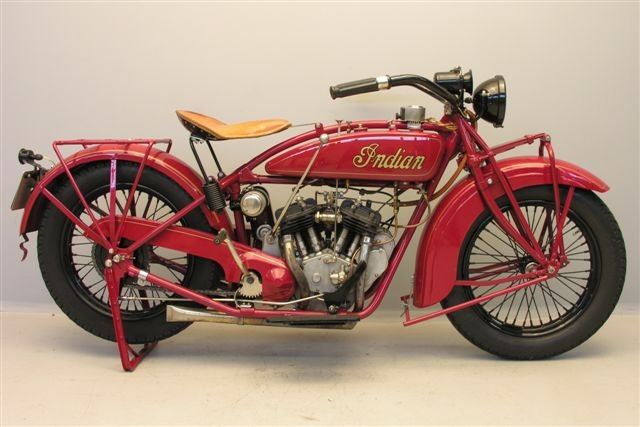 During the war years Indian motorcycle production amounted to approximately half that of its major rival, Harley Davidson, largely because the US armed forces adopted the 750cc Harley Davidson WLA model in preference to Indian's 500cc 741. 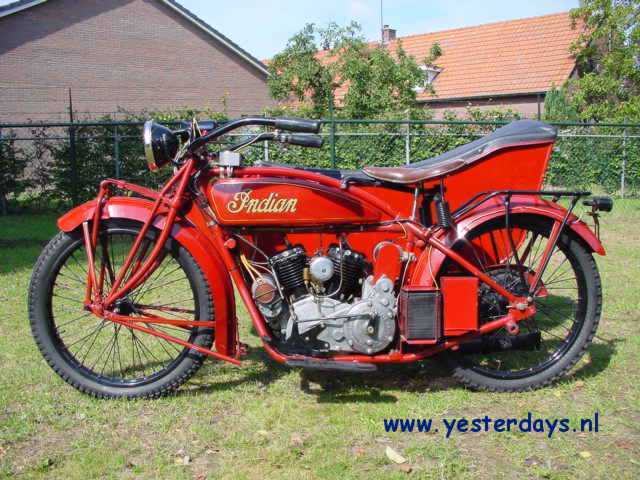 Indian did however supply a number of the allied forces with machines, the first significant contract coming from France in the first year of the war for 5000 military specification Chiefs with sidecars. 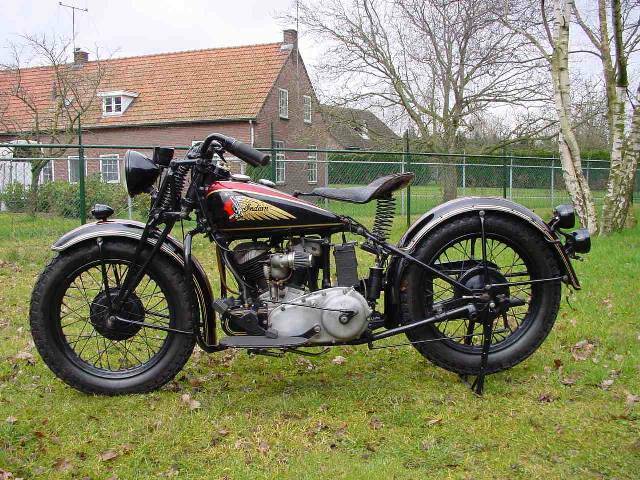 Typed 340M by the factory, the machine retained the plunger rear suspension introduced for the 1940 model season and although visually different to the civilian model because of the non skirted mudguards fitted, actually differed very little from its civilian contemporary. 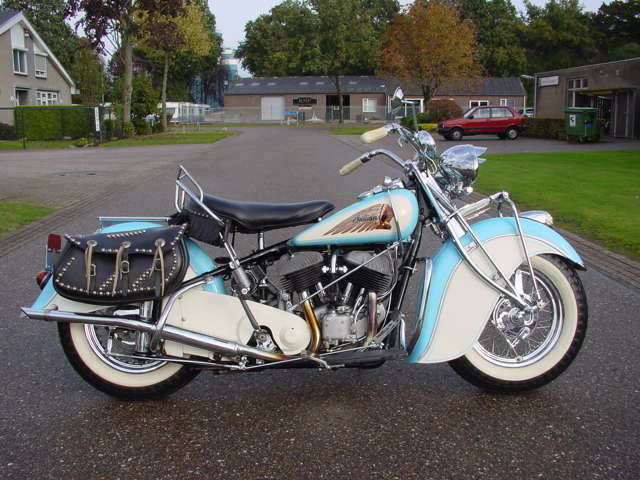 1940 Indian Chief 340 Re-done by the late great Paul Gambaccini in 1989 , The engine case is stamped with his mark, PJG . 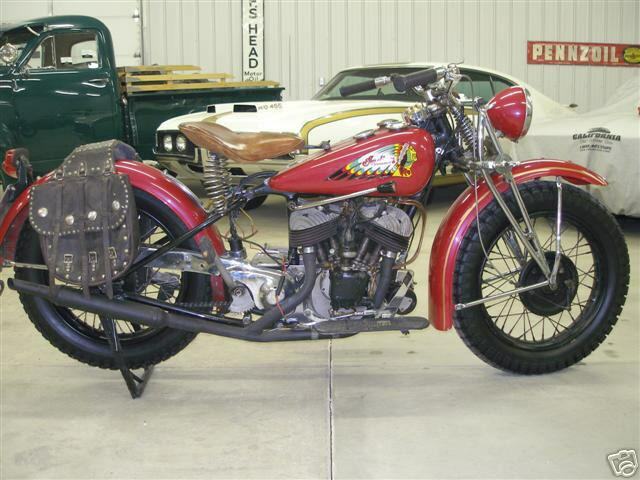 1943 Indian Scout 741B Military 500cc. 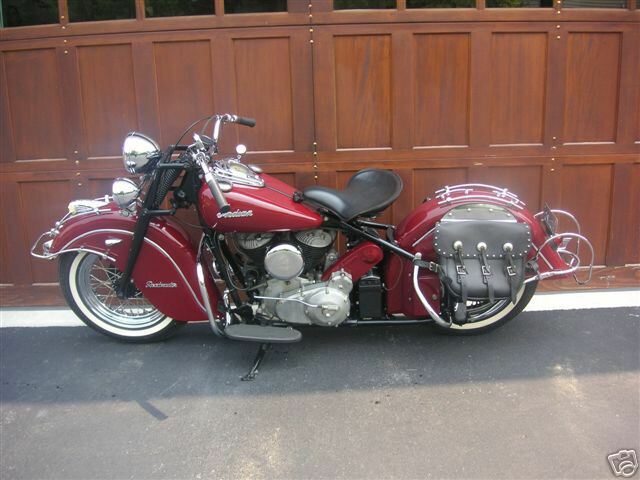 1945 Indian Chief 1945 Indian Chief Police Bike. 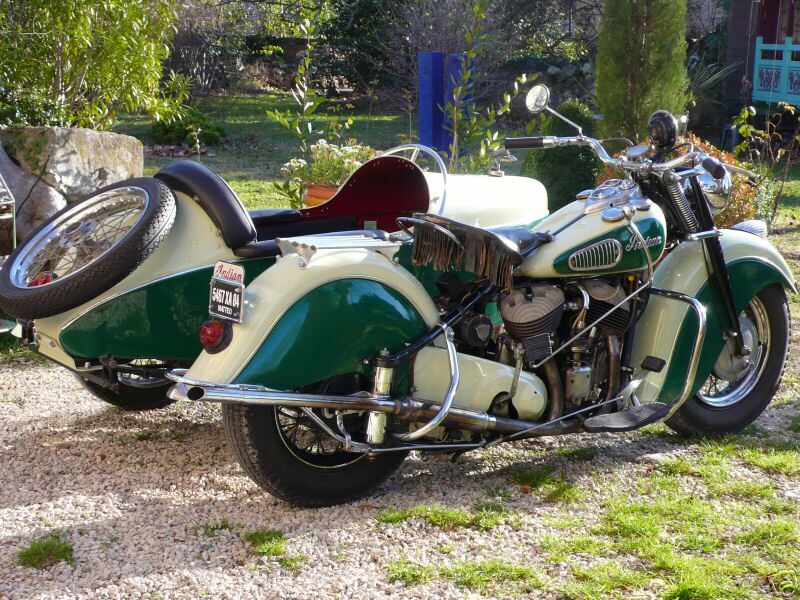 1947 Indian Sport Scout 750cc. 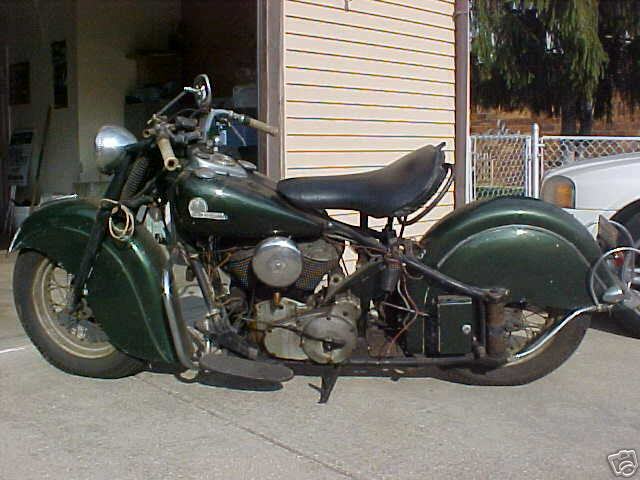 1948 Indian Chief 648 1200cc. 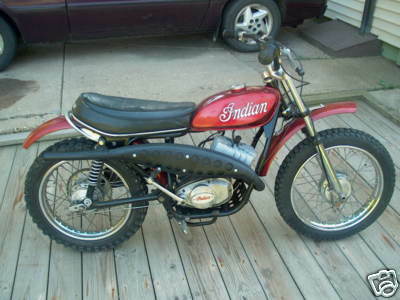 1969 Indian Velo 500 Eventually, Clymer succeeded in creating this machine, the Indian Velo 500. 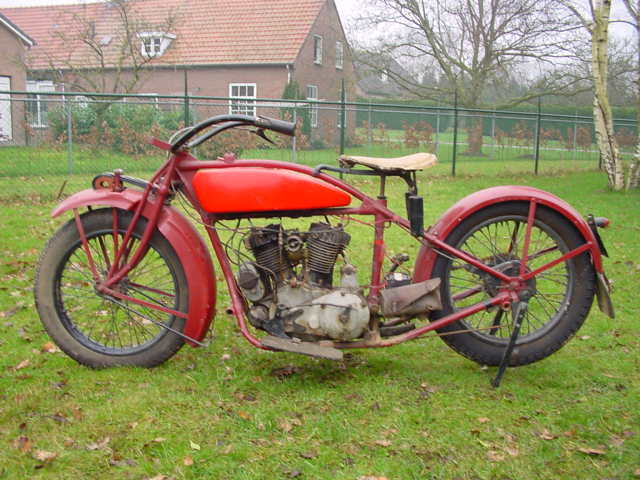 It combined an Italian frame and other components with an engine from the British Velocette factory. 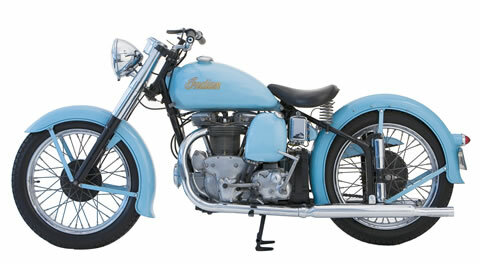 And in 1969, he offered the Indian Velo 500 to the public. 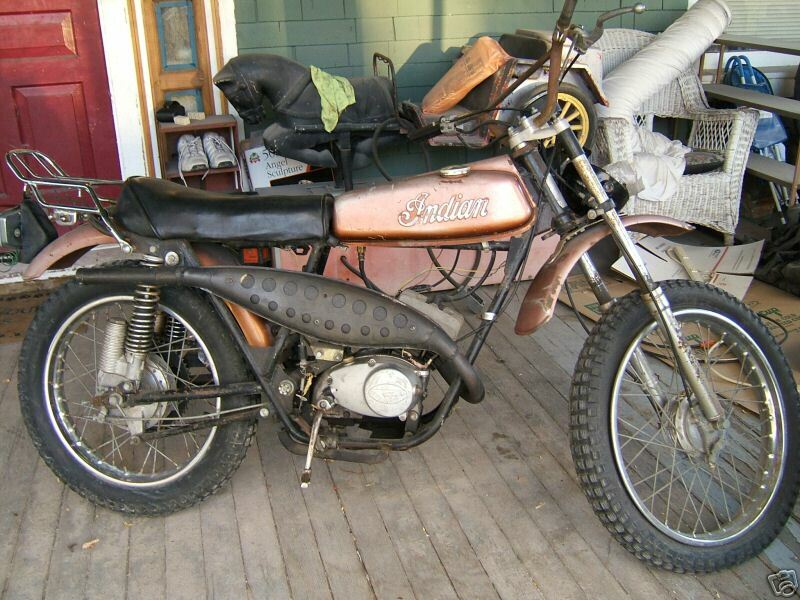 1970 Indian Dirt Bike 70c.